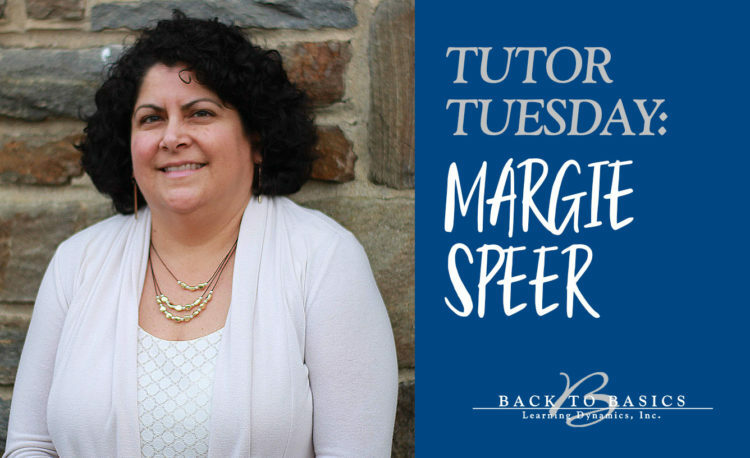 TUTOR TUESDAY: Margie Speer | Back to Basics Learning Dynamics, Inc.
Building students’ confidence as she works with them individually is one of Speer’s greatest strengths, and one of the aspects of tutoring that she finds to be most rewarding. Speer’s background is not the traditional path for an educator. Her degree is in mechanical engineering, and she has considerable professional experience in the field. Speer was a full-time mom until her son was in ninth grade, when she responded to a posting for a long-term sub position teaching engineering technology at a vo-tech program. The school offered her a full-time position after the first semester. Although she loved teaching and working with the students, she wanted to stay more flexible than the “full-time-plus” hours expected of a teacher. Once she was hired at Back to Basics, Speer worked in a wide variety of settings. She has worked at the Back to Basics private school, Title 1 programs, homebound support, and 1-on-1 tutoring at the middle and high school levels. Currently, she tutors students in math through Algebra 2, but she has also worked with physical science, chemistry, and other subjects. Speer suggests one of the most important ways that parents can help their children as they progress through middle and high school is to stay involved. Contact us to get started with 1-on-1 tutoring today. Sometimes this is where Speer sees that tutoring helps the most. “Sometimes kids feel they don’t want to say anything in class. They don’t want to be the one to raise their hand,” she observed. In 1-on-1 tutoring, though, that same student will be more comfortable asking questions. Her children are now following in her footsteps. Her son is about to graduate this spring with a degree in mechanical engineering, and her daughter is studying chemical engineering. Both of them attend challenging university programs. She encourages her children to put in their best efforts— but not to stress out too much.